Although there are hundred of programs out there that promise you will make money using them on your blog; I have found that few are worth your time. Here are some I have tried and can recommend. 1) Social Spark is one of them I recommend the most. Register your blog and if companies are interested they will contact you with an offer. You can turn down any offer. Each post pays a different amount and it is negotiable. It is very easy to use and not a scam. I've have successfully used Social Spark. 2) Blogsvertise This program is the same as social spark. Register your blog and an advertiser will contact you if they want to pay you to post about something. You can accept or reject the ad. LinkShare - I have used this in the past, but currently I am not running any ads from them. I have nothing negative to say about them and there is no particular reason I am no using them at the moment. The one ad I did run in the past with them was a Lego ad. Join LinkShare Today! You can sign up for an account and browse through the companies available through them. 4) Savvy Source - Savvy Source is another website I have used. They have many cities they offer daily deals in. You can sign up for an account and get a ad widget for your blog. If anyone purchases something through it you get a small percentage. I have run this ad in the past, but not currently. I know of a few bloggers that have made $100 or more a month using Savvy Source. 5) JuiceBoxJungle has an ad network that you can participate in. You place widgets like this one shown and you get a 50% ad split with them. This is another type of ad that I know some bloggers are making $100 a month or more from. 6) Commission Junction is another ad network that has lots of different companies you can choose from. I have been trying their ads for a while, but have yet to make any money off of them. That is where I got the Travelocity and Priceline ads. They charge you fees to work with them, which they take out of any revenue you make. 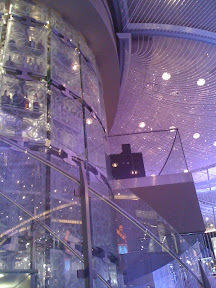 The Chandelier Bar inside the Cosmopolitan is unique and kind of fancy! The atmosphere is relaxed and hip. 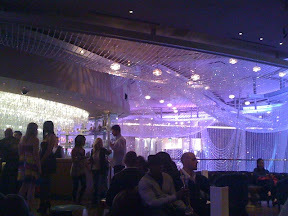 It is three levels inside the casino floor inclosed in jewels to make it look that you are sitting inside a chandelier. This bar gets a lot of hype and it's deserves it. There is a live band every night performing on one of the levels. You can hear throughout the bar. The music is a compliment to the atmosphere and you can easily chat with friends without having to strain. I don't hang out at many bars. With little kids I rarely go out, but when I do this is one of the stops. If I have company in Las Vegas visiting me I take them here. 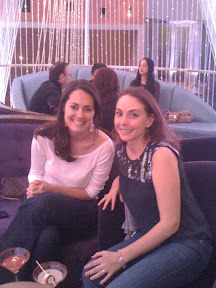 I took my friend Tiffany when she was in town and we indulged in some interesting martinis. I had the s'more martini and she he the Dragon fire martini. The little raspberries you see on the plate are suppose to make you breathe fire while you eat them. They didn't work though. The Sugar Factory is the brand new candy store that opened in front of the Paris Hotel, in Las Vegas that is known for couture lollipops. I didn't know that there was such thing as a couture lollipop. I had bad feelings about this store because they knocked down the beautiful fountain in front of the Paris casino to build it. I changed my mind after going in there. It is really well done and fun for the kids. They let the kids sample candy for Free until they can decide what they want. My kids, of course, took advantage of this and had at least ten samples. There is also an ice cream counter, hand made chocolates, and gourmet cupcakes. You are also allowed to sample the ice creams. My son sampled 4-5 of those! The other half of the store that I did not get any picture of is their restaurant, Sugar Factory American Brasserie. Once again I find myself at the Gold and Silver pawn shop featured on the tv show Pawn Stars. I'm not sure why, but everyone wants to go to this pawn shop. I haven't seen the show yet. Maybe I should so I can "get it". Everyone I take is surprised how small the shop is. Apparently it looks much bigger on tv. The shop is as big as it appears in the pictures I took. It is free to get in and can be found not far from Fremont Street. The address for Pawn Stars is 713 Las Vegas Boulevard South, Las Vegas, NV 89101-6755. The phone number to the store is (702) 385-7912. It is also kid friendly. The swimming pool at Mandalay Bay in Las Vegas is so much fun. My friends were in town and staying at Mandaly. I was pleased when it was hot enough to actually go to the pool. (I know that in a few months when it is over 100 degrees everyday I will regret wanting the heat. ) If you are not staying there you can still go, you just have to pay. The wave pool was really good and was on the entire time we were there. I had heard that it isn't always turned on. The water is heated. The waves are strong and they have a height restriction of 48 inches. The lazy river was heated too! It is a decent length around and only 3 1/2 feet deep. The hotel does not provide tubes to float in, but they will sell you a very expensive one! There is another large regular pool that I didn't get a picture of. They also have tons of chairs. Each day we had to search to find a few empty chairs together, but we always found a few. Two of the questions I get ask the most about blogging are, "Can you make money blogging?" and "How do you make money blogging?. Yes, you can make money blogging and there are lots of ways to do it. I know because I've tried like a hundred ways. Many of them aren't worth your time, but some are. 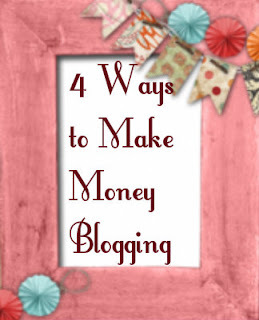 Here are 4 ways I make money off my blog that are good enough to actually recommend. Social Spark is a sister company to Sponsered Tweets, but instead of making money from a tweet, it's from a blog post. You create an account for your blog and if companies are interested in you reviewing them or writing something about them they will contact you with an offer. You can turn down any offer you are not interested it. Each post pays a different amount and it is negotiable. It is very easy to use and not a scam. I've have successfully used Social Spark many times. I have not been using shareasale.com for very long, but I was able to meet with the people behind this website while I was at Blogher and I was very impressed. They like working with bloggers and want you to succeed. They are growing too. With Google ending their affiliate ad network, Shareasale has picked up many of their merchants. Which means there is a high chance they work with a company you might want to work with. Escalante Network is a good one to work with. They email you several times a week and you literally just have to copy and paste. I find them less time consuming and the most engaged. It's mostly deal type offers like coupons. The newest way I'm trying to make money blogging is with Goldstar. They have discount tickets for shows and plays in different cities. Chances are they offer 50% off tickets in your city or a city near you.